On June 2, 2011 @ 07:02:36hr AEST, a special new moon also known as Solar Eclipse will occur in Sydney, Australia. This eclipse, saros cycle 13 Old North will arise at 11 degrees of the double bodied sign Gemini. The significance of this eclipse will be felt across the entire Australian country. The lord of the eclipsed Sun is Hermes, Mercury the planet of contestation! Mercury is at 28 degrees of the Bull, Taurus and is in the confines of Mars. The ruler of Taurus is Venus, and Venus is separating from Mars. 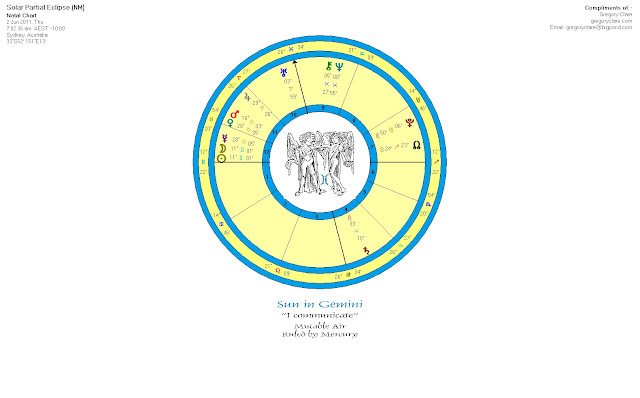 Eclipse Venus is co-joined to the Australian 1901 federation charts Moon, the natal 1901 Moon is in the Australian 2nd house of wealth and movable resources. The natal Moon rules the 1901 4th house of mines, geology, and weather and opposition parties. The implication of these aspects will continue to bring about attacks on our Women in this country. The profected year lord for Australia 2011 is Hermes, and this eclipse will fall in the 3rd house of the 1901 natal chart. 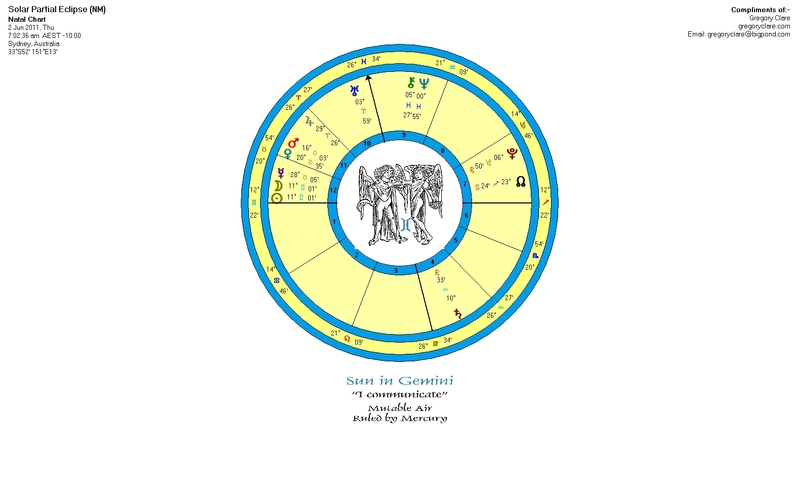 The third house is the highlighted Zodiacal place for the year 2011 and as such we can begin to understand why these Media driving attacks will continue. The eclipsed Sun will be in direct opposition to the 1901 Venus in the 9th House of publishing. Furthermore the eclipse Mars/Venus aspect is co-joined to the natal Moon, insuring that the hostile attacks will be related to the past. The other significant aspect in this eclipse is the position of Jupiter, 29 degrees Aries. This aspect sit’s exactly on the 1901 ascendant. Jupiter on the ascendant you think would be a good thing, as Jupiter is known for his abundance. However this may not be the case this time as Jupiter is under the rulership of Mars. Mars in the Eclipse and natal chart is in an indifferent state, meaning it has no real power to act. The coming month will be very interesting from the political prospective as a Lunar eclipse will occur on June 16th 2011, and this will involve the 1901 natal Mercury/Neptune and eclipse Mercury. As well on July 1st 2011 another solar eclipse, saros 13 New North will take place. This eclipse degree will be in direct opposition to the 1901 natal Sun, which is a representation for the Leader. Please stay tuned as I will endeavour to bring too you the latest on the Mundane events.